It just goes to show how careful you need to be with your Gaelic translations. Some authorities translate "Banchory" as smooth hollow; others as white cauldron. The first of these alternatives takes as its justification Banchory's location on the south facing slopes above the north bank of the River Dee, 15 miles west of Aberdeen. The second suggests the name comes from the rapids in the nearby river. Take your pick. 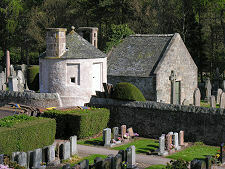 The original settlement here lay towards the east end of today's Banchory, where St Ternan had established a church by as early as AD 500. A series of churches followed on the same site, though when the last was demolished its replacement was built further to the west where the more modern settlement grew around the north end of the bridge built over the River Dee in 1798. Today the old churchyard remains, complete with a two storey circular watch house designed to deter body-snatchers. 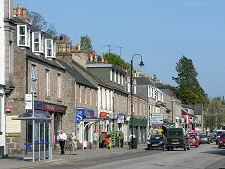 For most people, though, the name of Banchory is part of a pair often heard on radio traffic reports in winter. Banchory lies at the north end of the B974 Cairn o' Mount road, which provides a short cut across the eastern arm of the Cairngorms as the mountain range finally descends towards the sea. It is usually the announcement on the Radio Scotland traffic news of the closure by snow of the B974 from Banchory to Fettercairn that heralds the approach of winter, just as the first cuckoo is meant to signify the onset of spring. 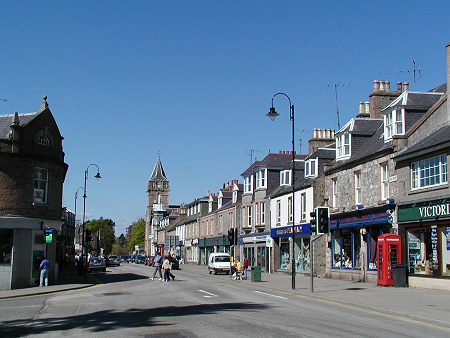 Banchory grew significantly through the 1800s. 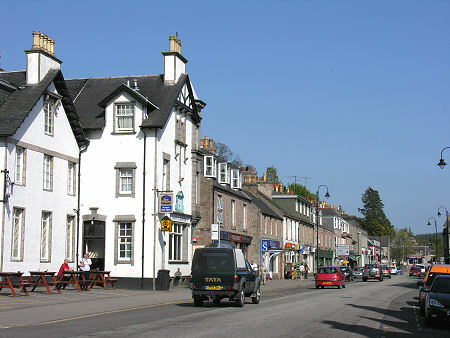 The railway reached the village in 1853, en route to its eventual destination in Ballater. With it came an influx of hotels and other businesses. The railway departed again in 1966, but plans are afoot to re-establish it as a tourist venture. 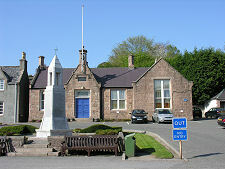 A golf club appeared in Banchory in 1905, and nearby Crathes Castle adds to the range of tourist attractions on offer in or around this attractive village. These also now include a golf driving range, mountain bike trails and a skatepark near the centre of the village. 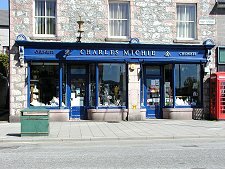 A stroll around Banchory reveals a very well served community. There is a supermarket here for the staples of life, but the main street reveals a fascinating mixture of shops that are not at all the usual chain-store clones, and which apparently thrive in this Deeside atmosphere. A short walk south from Banchory takes you past the camping and caravan park to the bridge over the River Dee. Here you can begin to appreciate the attraction so many feel for this river, and not just those with a fishing rod in hand. Where the Dee meets the River Feugh you can, if you time it right, watch salmon leaping as they make their one-way journeys back to the waters of their birth. 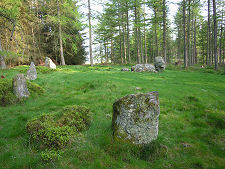 South of the River Dee the countryside becomes surprisingly remote and here you can find evidence of the area's ancient residents in the form of three stone circles, most notably the Nine Stanes Stone Circle, now surrounded by forest. Banchory is an attractive place. It feels a little like the dormitory for Aberdeen that it is: and it feels a little like a place of transit for visitors and tourists en-route to somewhere else, and it is that too. 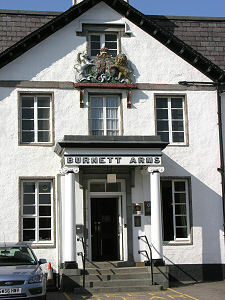 But if you are passing through, it is well worth some of your time getting to know it better. 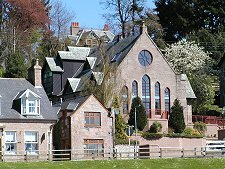 Those looking for somewhere to stay near Banchory could do far worse than the excellent Raemoir House Hotel, standing in its own grounds some two miles north of the village.